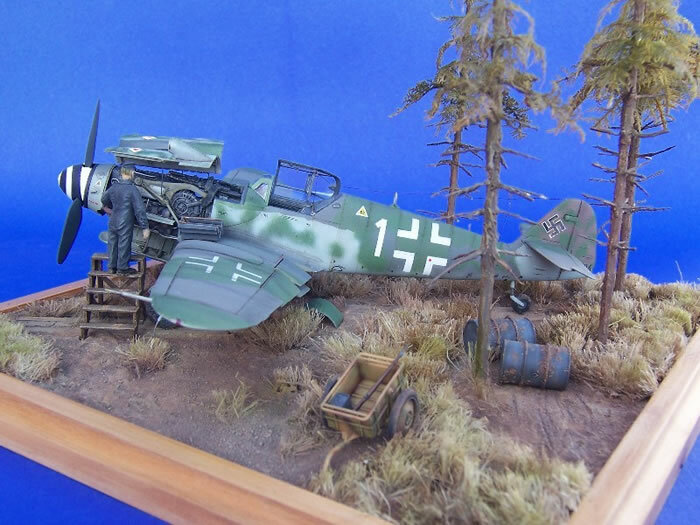 Here I present some photos of the last Bf 109 built by me which is a K-4. 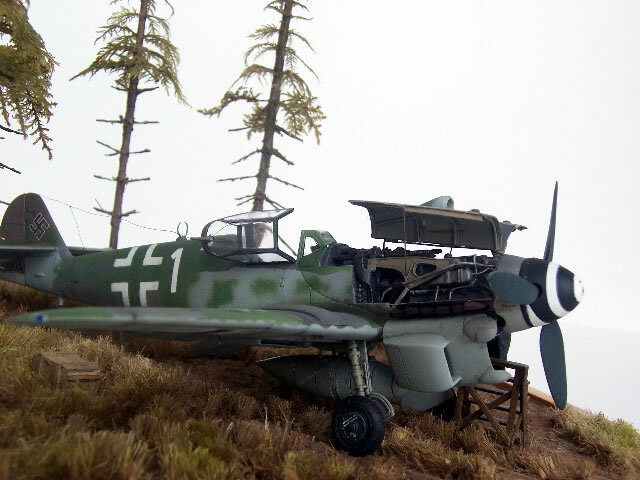 The displayed plane” white 1, W-Nr. 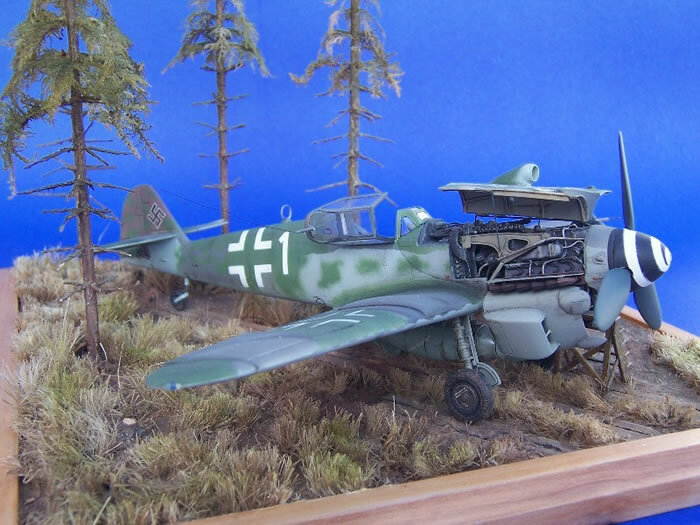 330207 belonged to 9./JG77 and was lost during Operation “Bodenplatte” as “white 13” on 1st of January 1945 piloted by Lt. Abendroth. There are some photos existent from this plane. 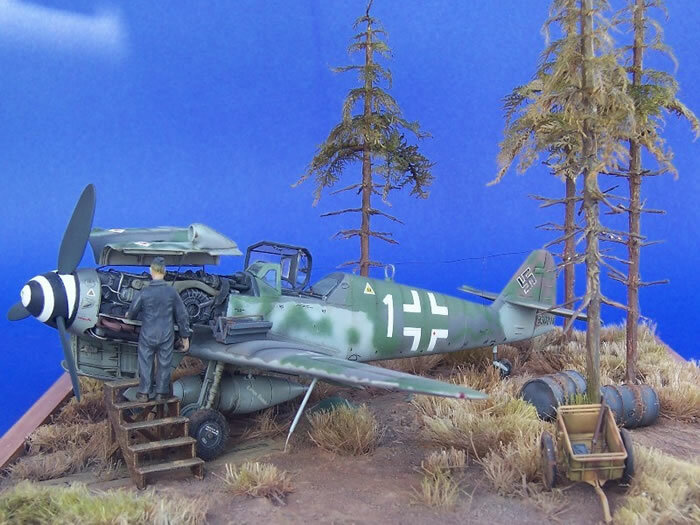 According to the descriptions which are attached to these photos in the different sources these photos have been taken in autumn 1944 on Neuruppin airfield. 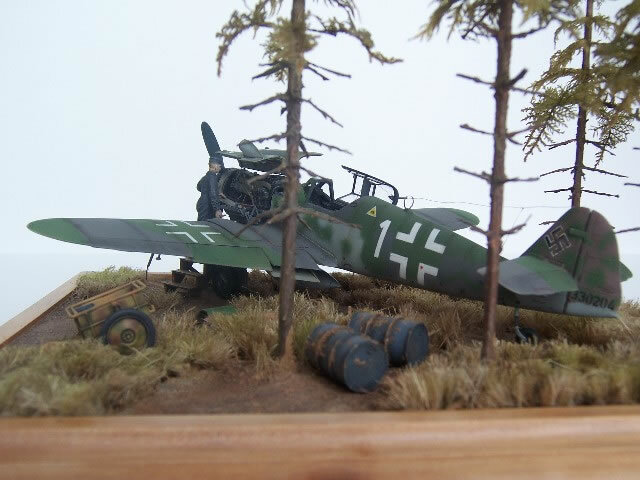 At this time the plane has been piloted by Hptm. Menzel. 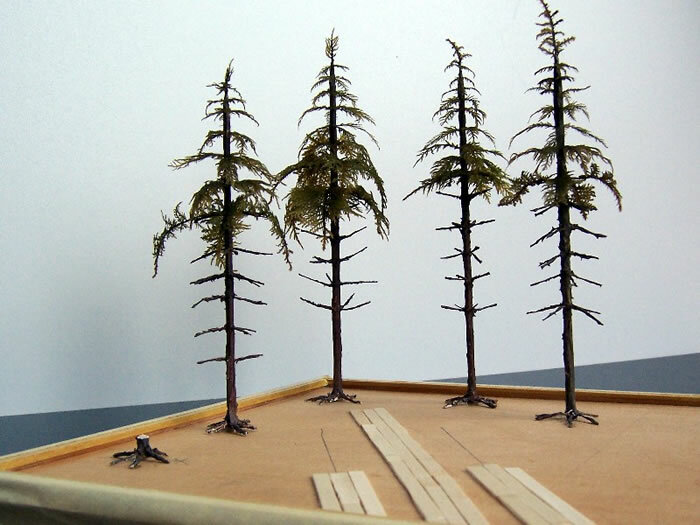 One of these photos inspired me when building the small diorama to display the model. 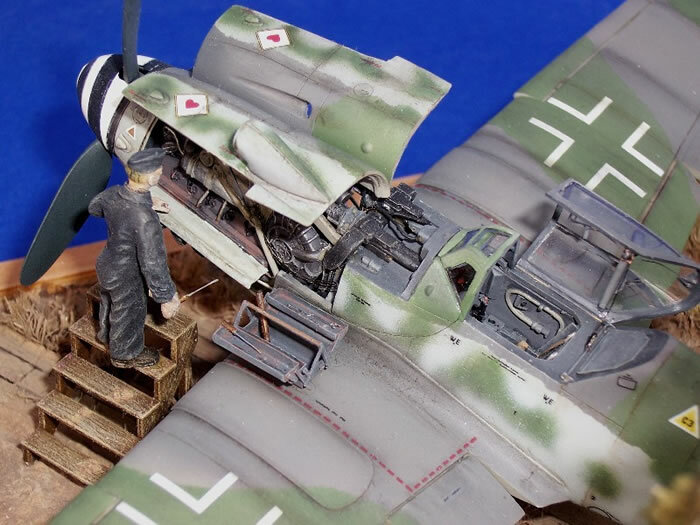 To build the model the 1:48 kit “J1” from Fujimi has been used. 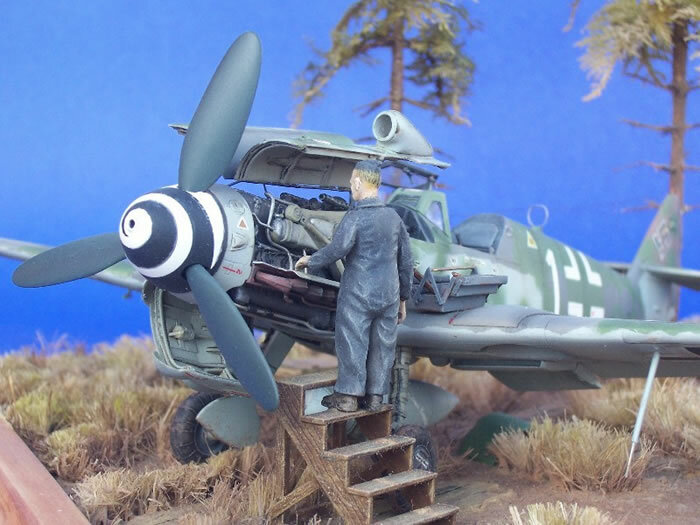 The kit contains all parts to build a Bf109 G-14/R1 Jabo, but because of the modularity of the Fujimi Kits it can be used to build a Bf109 K-4 too. 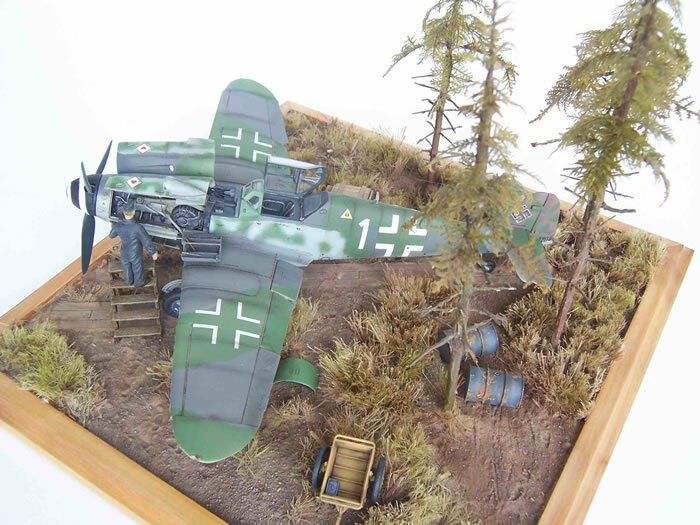 For this model the Formatex detail set has also been used. 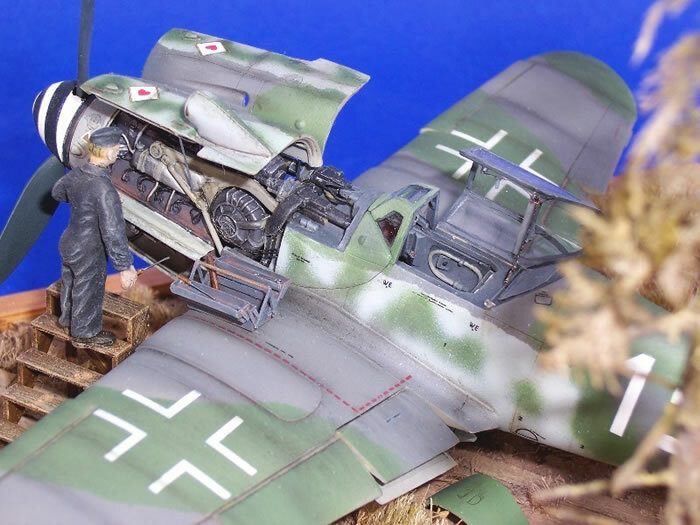 This resin detail set is designed for the Fujimi kits and contains a new cockpit including photo etched seat belts, an engine and fuselage gun compartment as well as new very fine cowls. 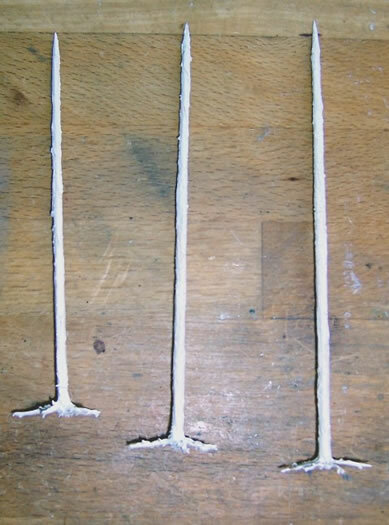 For further detailing tubes made by wire of different diameters have been added to the engine. To do so photos from different sources (books and internet) have been used. 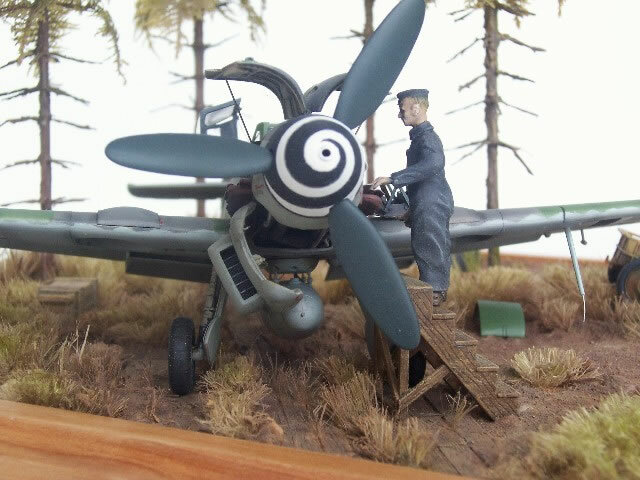 Some additional detailing has also been done for the mounting of the jettisonable fuel tank, and the hinges of the cockpit roof and the antenna tightening mechanism. Brake pipes have also be added to the undercarriage. Painting has been done by using Xtra Color and Model Master paints. Weathering has been done with thinned oil paint and chalk. The decals are from a Cutting Edge decal sheet. 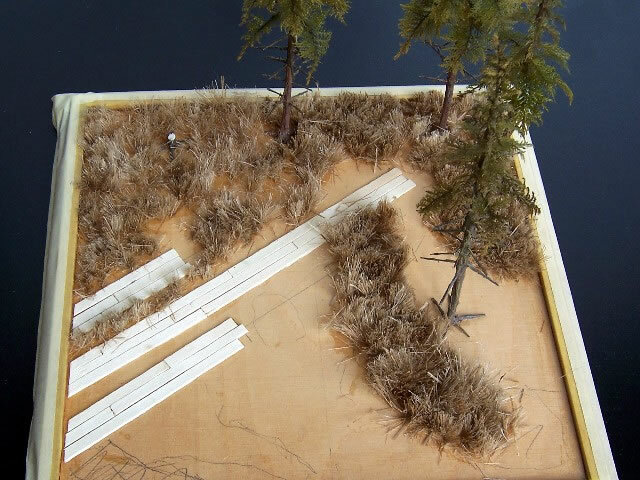 The diorama bas is made of plywood with a frame of self made strips of pear wood. The planks are made of plywood of orange boxes. 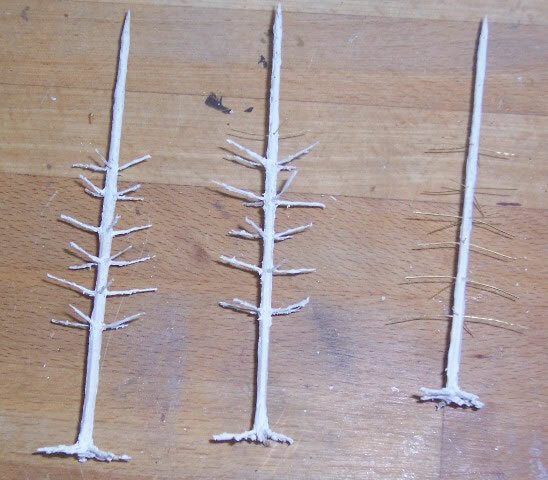 The trees are made of wood spits, bras wire, 2 component car putty and moss. To build the grass, plumbers hamp has been used. 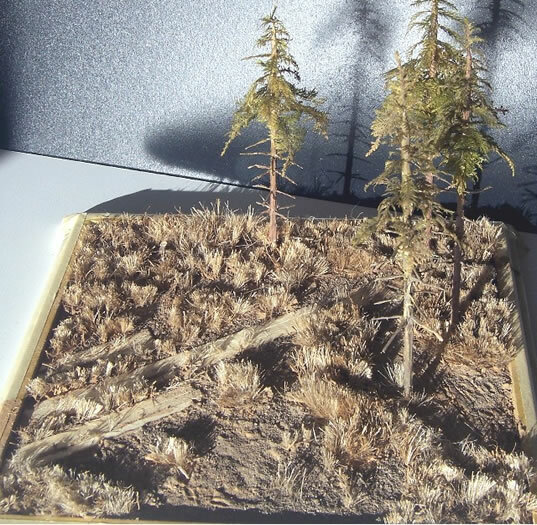 The terrain is made of landscaping mortar and dust from the garden in different graining. The foot steps of the mechanic as well as the grooves of the gasoline barrels have been made in the not already hardened mortar. 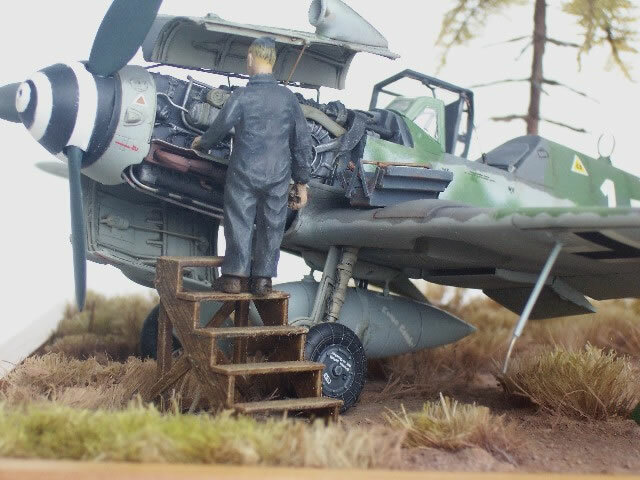 The mechanic and the ladder are from a Trimaster Me 262 kit. The barrels, the infantry cart and the carabiner are from Tamiya. The tool box has been scratch built from 0,2 mm copper sheet. 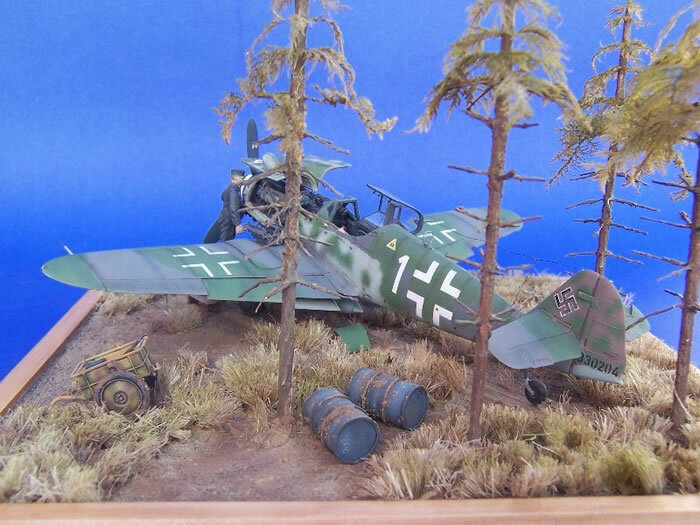 This was the first Bf109 I built by using a Fujimi kit. Others (G-10 reconnaissance plane and G-6) will surely follow.